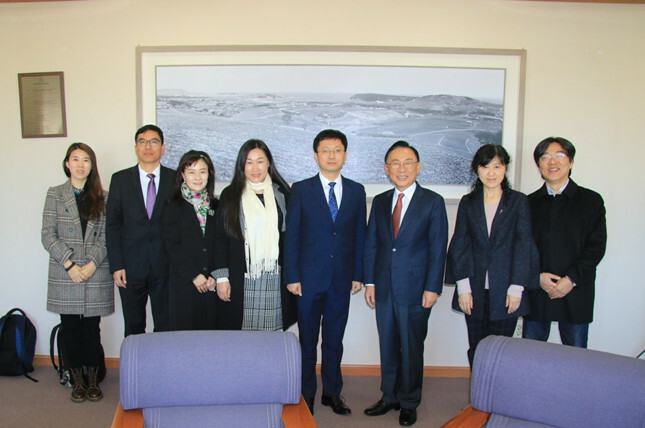 From March 26 to April 2, SSPU delegation headed by Vice President Mo Liangjin visited Broward College (BC) in the U.S., Ulsan College (UC) and Busan University of Foreign Studies (BUFS) in Korea. The delegation had a conversation with each university on exploring and deepening the cooperation. From March 27 to 28, the delegation visited Broward College (BC), with whom the joint programs—Supply Chain Management Operations and Web Development—at higher vocational level began enrollment since 2015, and the first batch of students graduated in 2018. The delegation were warmly welcomed by David Moore, Executive Director of BC, and heads of relevant departments. On March 28, Joint Management Committee Meeting 2019 was held following a preparation meeting held on March 27. On the meeting, SSPU and BC reached certain consensus on various subjects and signed relevant documents. During the visit, the delegation also met with Jiang Zhennan, SSPU student studying for bachelor degree at BC. He is the first SSPU student being awarded BC Scholarship. On April 1, the delegation visited Ulsan College (UC) in Korea and received a warm welcome from Heo Jeongseok, President of UC, Yeonjoo Lee, Head of Global Education Center and others from relevant departments. UC was founded in 1969 by Chung Ju-yung, founder of HYUNDAI Heavy Industries Co., Ltd (HHI). The college features its devotion to cultivating technical talents needed in shipbuilding industry, automobile industry, etc. In June 2018, SSPU and UC signed a Memorandum of Understanding. This time, the two sides reached consensuses on student exchange, training and test for vocational certificates, teacher mobility, etc. The delegation also had a campus tour and visited HHI shipyard. 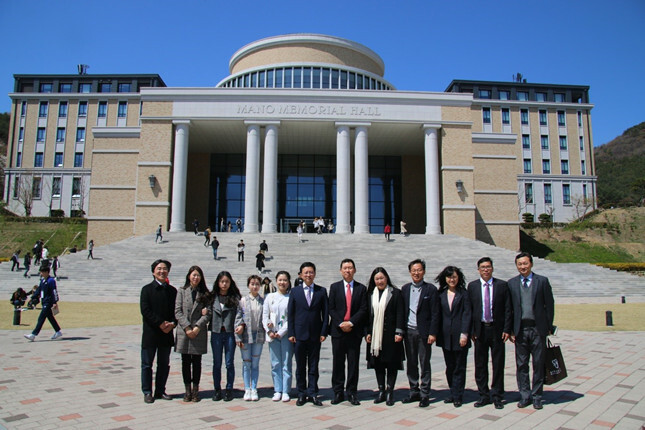 On April 2, SSPU delegation visited Busan University of Foreign Studies (BUFS). 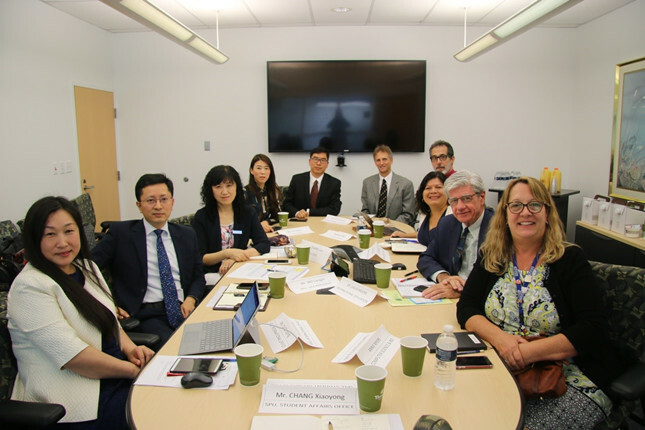 Dr. Hwang Gwiyeon, Vice President of BUFS, Han Gangwoo, Dean of Office of International Affairs, and heads of relevant departments welcomed the delegation. Both universities had an in-depth discussion on cooperation in the fields of Information and Telecommunication Technology, and Business. The delegation also visited Student Service Center, Academic Affairs Center, Student Activity Center, library and so on. SSPU and BUFS signed a Memorandum of Understanding in December 2015. There have been 6 students of Applied Korean going to BUFS as exchange students or to study for bachelor degrees. During the visit, the delegation met with the 4 students studying at BUFS now. Heads and teachers of International Office, Student Affairs Office and College of International Vocational Education were in the delegation.